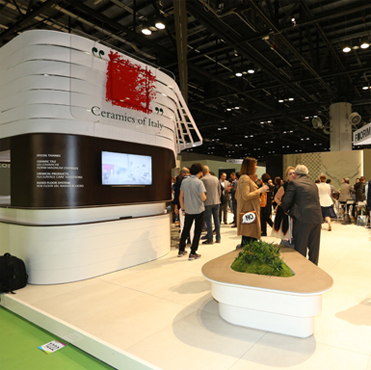 (Orlando, FL – April 2017) Now in its 24th year, the Ceramics of Italy Tile Competition – the longest-running award program of its kind – is proud to announce six outstanding projects that wholly represent the competition’s goal of honoring the admirable use of Italian tile in North American architecture and design. Sponsored by Confindustria Ceramica (the Italian Association of Ceramics) and the Italian Trade Agency, the competition attracted high-quality submissions in each of the three categories: residential, commercial, and institutional. An international jury of design industry experts reviewed and evaluated the projects, ultimately selecting three winners and three honorable mentions among the steep competition. The jury selected the winners of the Ceramics of Italy Tile Competition using the following criteria: the creative and effective use of Italian tile, the overall quality of the installation, the aesthetic beauty and functionality of the design, and the sustainable attributes of the overall project and materials used. Though vastly different in scale and aesthetic, the projects illustrate how Italian tile plays an important role in the realization of thoughtfully conceived interior design and architecture. From its functional advantages – being durable, hygienic, and easy to maintain – to the superior qualities that set Italian producers apart – leading edge technology, unparalleled quality and aesthetic excellence – Italian ceramic tile is a versatile and high performance material that architects and designers repeatedly seek out. The winners will be officially announced at Coverings – the largest tile and stone show in North America taking place April 4-7 at the Orange County Convention Center in Orlando, FL – and will present their projects during the Ceramics of Italy International Press Conference on April 5 at 4:30pm in Room S210C. The winning firms will each receive a prize of $3,000 as well as an all-expenses-paid, CEU-accredited trip to Bologna, Italy to attend Cersaie – the world’s largest exhibition of ceramic tile and sanitaryware in Bologna, Italy – as part of a VIP delegation of specifiers and journalists. Contractors and distributors involved in each winning project will also be awarded a cash prize for their valued contribution. This project is the last element in a beachfront residence on New York's Fire Island that includes a dining pavilion, gym, and beach/pool cabana in addition to a main house. For the guesthouse, the architects were charged with creating an independent space for visitors that would retain a close connection to the main home. The architects used tiles from Emilceramica’s Fashion series to blur the line between the indoor space of the guesthouse and the adjacent outdoor pool area while lending a warm, neutral palette to the 2,000+ square foot space. Italian tile also provided the guesthouse and adjacent patio with a consistent design and level of durability that could withstand moisture and the high traffic resulting from a typical day at the beach. One of California's historic Case Study Houses and the only one built in the San Francisco Bay area, #26 in San Rafael was designed by architect Beverley David Thorne in 1963. After purchasing the house 2015, the current owner/architect, Cord Struckmann, undertook a thoughtful remodel that included replacing the floor finishes in the common areas. Previously covered with carpet and vinyl tile, the project required the careful selection of a durable material that could also contribute to the design integrity. This led to the selection of Gigacer’s Concrete line, which matched the mid-century modern aesthetic of the house. The minimalist, large format tiles blend seamlessly with the structural bones of the house and the modernist décor, unifying the common areas and elevating the role of the floor in the space. MediaMath’s headquarters occupy two levels within 4 World Trade Center in New York City. 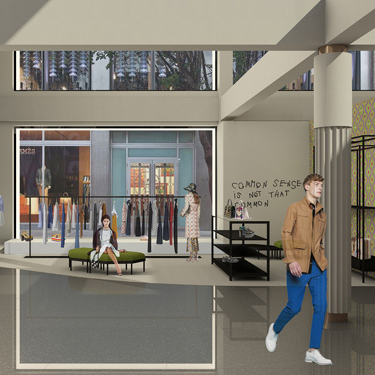 In addition to workspaces, the company required lounge areas, a yoga room, a theater, and an art gallery for use among their 500 employees. Ceramiche Refin’s Design Industry collection was used in the most important space in the project: the double height entrance lobby, which provides the first impression to clients, potential employees and office visitors. It was critical that the floor be elegant but also easy to maintain, with a slab-like appearance that contained minimal joints. The minimalist look and large format of the Design Industry collection met all of these requirements, resulting in a lobby floor that is low maintenance and visually stunning – a perfect complement to the dramatic ceiling treatments throughout. At a resort located on Geneva Lake in Wisconsin, a recent, multimillion-dollar renovation led by CallisonRTKL refreshed the property for a new generation of visitors. Central to the successful redesign of the pre-existing resort building was updating the common spaces and restaurant with a modern look that preserved the traditional atmosphere guests had come to expect. For the lobby and communal seating areas, the highly detailed, bleached wood-look tiles of Provenza Ceramiche’s In Essence collection provide a timeworn yet contemporary look that retains the welcoming air of a resort lobby. In Essence offered a far greater resiliency than real wood, which was an essential element for such a high traffic space. In the resort’s lakeside restaurant, another wood-inspired collection, ETIC from Atlas Concorde, brings the sophisticated look of wood planks into the gray-scale palette of the space, while providing the functionality necessary for a restaurant. Contrasting with the interior design scheme, the bold patterns of Ceramiche Refin’s Frame collection forms the floor beneath the restaurant’s bar. The combination of these collections results in stylish, comfortable spaces that foster a soothing resort environment with distinctive interiors. Located at Columbia University’s new Manhattanville Campus in New York City, the Jerome L. Greene Science Center provides a home for the Mortimer B. Zuckerman Mind Brain Behavior Institute. 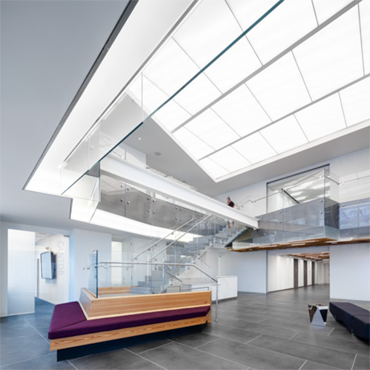 As a neuroscience institute, it was essential that the 450,000 square foot building include wide-open spaces for research activities and collaboration while adhering to specific light, noise, and thermal requirements. As over 60,000 square feet of tile was needed for the space, Renzo Piano Building Workshop chose Casalgrande Padana’s Pietre Etrusche collection (the Unicolore and Basaltina collections were also used) because of its large formats, functionality, and reputation for high quality. Crucial to the project was that the tile could be delivered in a timely manner from respected distributors and within a specific budget. Casalgrande Padana ceramic tiles helped to provide a clean, minimalist, and aesthetically unified space for the highly focused research conducted at the center. Ceramics of Italy is the trademark for Italian manufacturers of ceramic tiles, sanitaryware and tableware, that are members of Confindustria Ceramica. For more information visit www.laceramicaitaliana.it or follow Ceramics of Italy on Facebook (@CeramicsOfItalyNA) and YouTube (@LaCeramicaItaliana) as well as Twitter, Pinterest and Instagram (@CeramicsOfItaly).